The 2013 Honda NC700S is based on the Honda’s ‘New Concept Fun Naked’ concept which is a relatively new approach in this segment. As most of Honda’s nakeds the BC700S features a modern design language with sharp lines, dynamic shapes and clear cut surfaces. 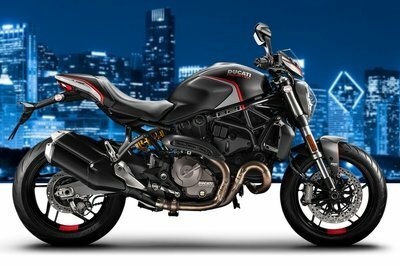 Not to mention about the wide range of paint schemes available which further enhance the modern look of the motorcycle. The 2013 Honda NC700S is equipped with a 670 cc, 2-cylinder, SOHC, PGM-FI engine that develops a maximum speed of 47 horsepower at 6,250 rpm and a peak torque of 60 Nm at 4,750 rpm. The engine is paired with a dual clutch transmission which delivers a pretty good fuel efficiency, as can hit 27 kilometers on a liter. 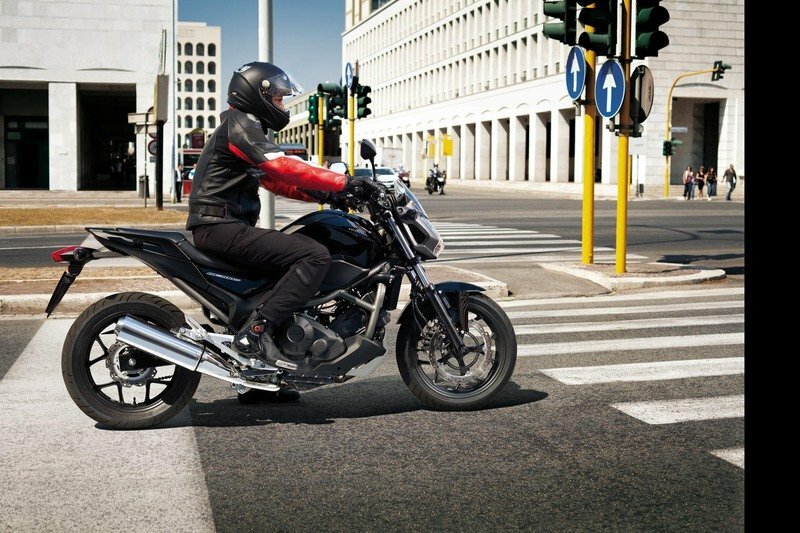 The 2013 Honda NC700S is kept in check by a set of front and rear disc brakes combined with an Anti-lock Braking System (ABS). 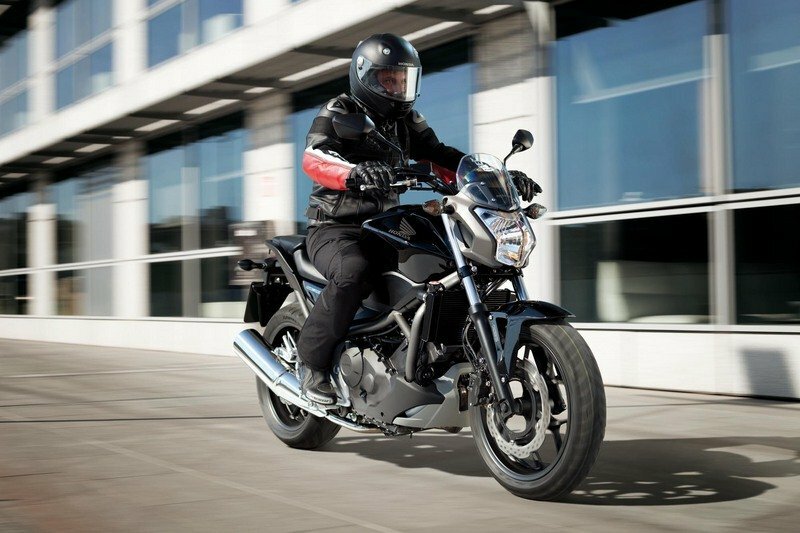 Hit the jump for more information on the 2013 Honda NC700S. The development team decided to propose a series of attractive, classic motorcycles that would bring joy to customers across the world. 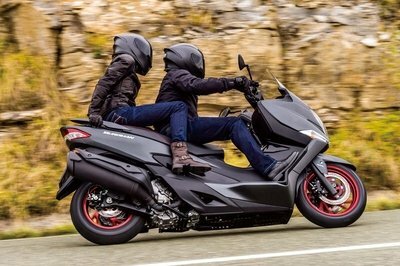 In the case of the NC700S, this would be accomplished by mounting a newly developed, fuel-efficient, easy-to-handle, 670cc engine on a common (to the series) frame and so create a motorcycle that would serve as a benchmark for the future not by being a simple extension of conventional thinking, but by meeting customers’ needs and the demands of the day. The NC700S is a user-friendly, naked model arising from a "Neo-FUNctional Commuter" development concept. 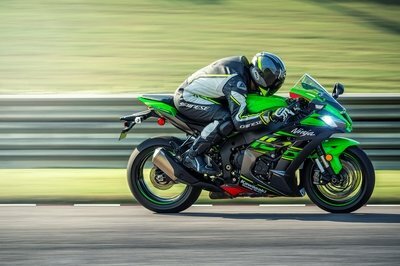 It fuses the straightforward characteristics that make it possible to experience the true thrill of maneuvering a bike with a powerful, distinctive and vibrant design inspired by classic styling. In addition to this, its low seat height provides excellent ground reach and a sense of security, while its simple yet agile naked style allows the user a relaxed and stress-free ride. 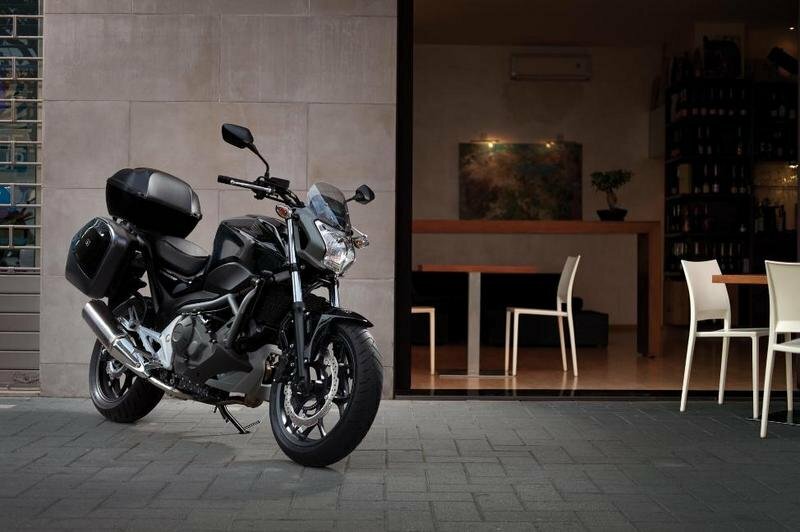 The NC700S is a naked model, but to emphasize its individuality, the machine has the dynamic proportions of sports gear. Its design gives a glimpse of the next generation of naked models, with clean lines and smooth surfaces from shelter to rear. The monocoque-styled shelter gives form to the nimbleness that sports gear both embodies and enables. Progressive design features permeate the machine down to its smallest detail: the functional beauty of its engine is supported by a powerful frame; the tail cowl has been cut short to bring the mass forward; outside the main colour area there is texture to emphasize newness and an exquisite contrast with parts in the coloured-resin area; its headlamp and meters are both simple and unique. Although the bike is intended to be practical and easy to use about town, this is not obvious from its slim and sporty exterior design: each condensed section of the bike is simple and compact; its low centre of gravity makes it feel easy to handle; inside the shelter is a large-capacity, easy-to-use utility space; it has a riding position that offers a high degree of freedom; its seat height is 790mm. Into the front face is incorporated a distinctive V-shaped multi-reflector headlight, which gives it a more intrepid expression. For the headlight stay Honda has used aluminium die-cast material shaped like a bikini cowl, creating a powerful and more individual front. Held in place by an aluminium die-cast stay are the bike’s meters, which are designed to make riding the bike more enjoyable. The compact meter provides the rider with accurate information and is laid out to be easily visible. 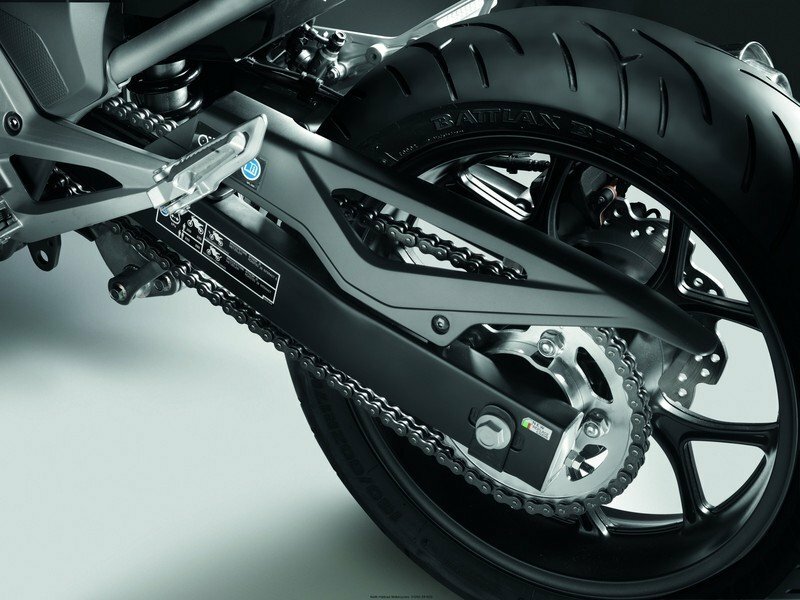 Subtlety in the design of the meter-area, which can be seen through the small screen when standing in front of the bike, imparts a functional beauty closely resembling that of precision instruments. The shape of the under cowl with its 3-piece structure effectively cools the catalyzer, which is positioned under the engine, and gives the lower portion of the bike’s body a functional beauty by giving the engine area cleaner lines and imparting a tautness to the overall styling. 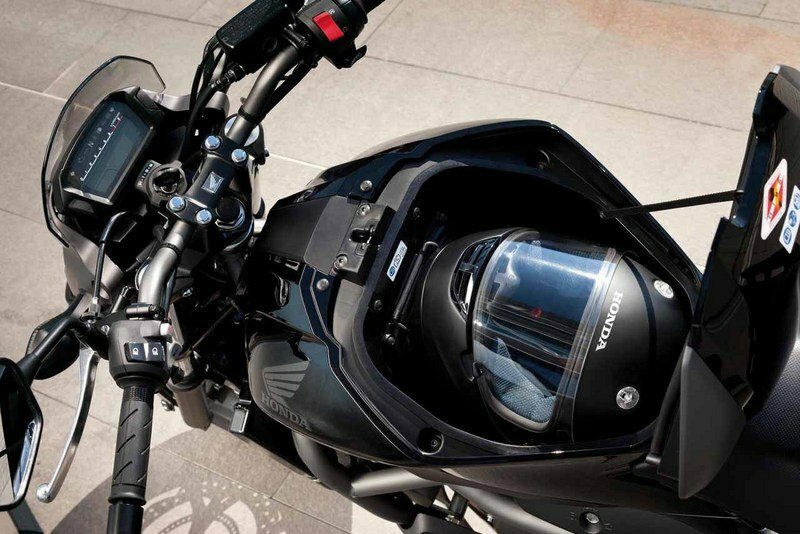 Located beneath the seat at the rear of the bike is a fuel tank of more-than-sufficient capacity (14.1 L). 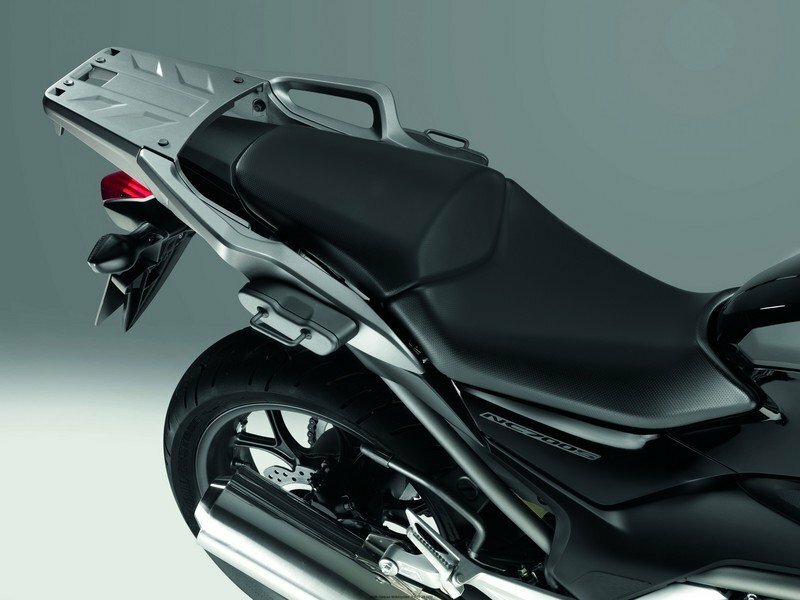 The tail cowl has been cut short to bring the mass forward and a very user-friendly rear-grip has been integrated into the tandem seat and rear panel. Down to the finest detail, close attention has been paid throughout to the feel of materials used. Bikez ---- "The NC700S is the product of a simple requirement: to deliver a motorcycle that is fun to ride and user-friendly at a reasonable price. 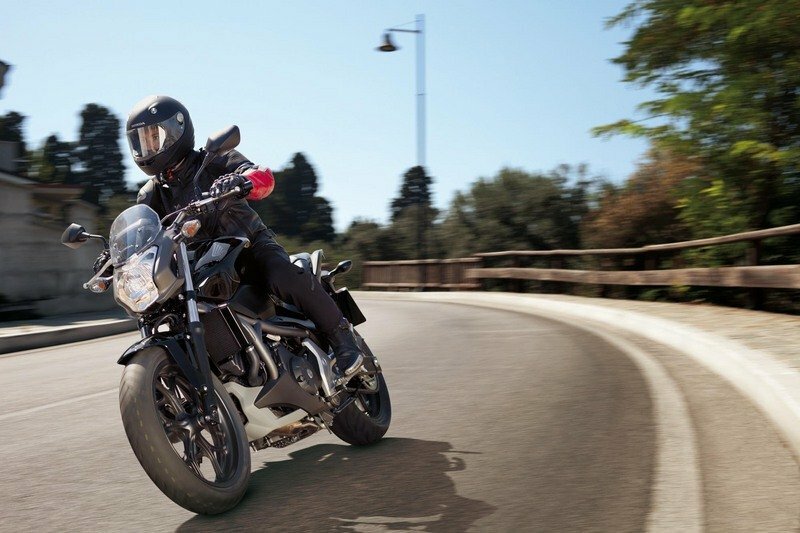 The NC700S offers the practicality of a commuter together with the thrilling handling and distinctive style of a naked." 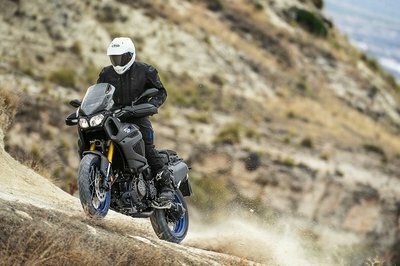 Asphaltandrubber ---- "Honda says it wanted to create a fun and user-friendly motorcycle when it set out to build the 2012 Honda NC700S — a simple, practical, two-cylinder get around town motorcycle"